Godfrey's Mama: "Hey, Jeanette! Play 'Love Shack'!!" My friend Jeanette came by the rehab unit today at lunch. She was a discharge planner for the hospital way back in the 90's. 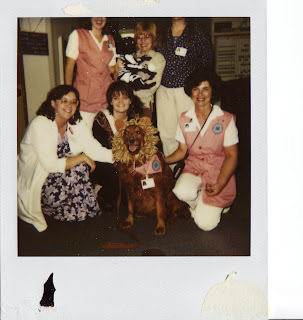 As I have posted before, many people have come and gone in the 20 years I have worked at the hospital. Some I barely remember. And, some I'll never forget. Jeanette fits into that latter category. It was so good to see her today, but it did make me a bit nostalgic. I found a couple of photos of Jeanette from the "good old days." The one above is from 1996. The hospital has a great pet therapy program. I think the staff enjoy the dog visits more than the patients. That is Jeanette at the top, holding Taylor the dog(yes, that IS a dog she's holding). 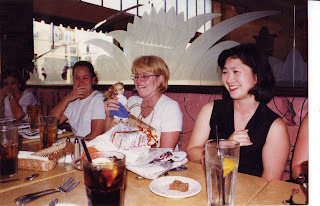 This is a picture from the goodbye party we had for her at The Cheesecake Factory. We decided to all give her gag gifts. That thing she is holding in her hands? It was our version of a rehab doll. In other words, we got a doll, gave it a craniotomy, put it's clothes on backwards, gave it a sling and a leg brace and ...presto, you got yourself a rehab doll. I think the only thing missing on it was a foley catheter. But, even we thought that was rather crass. Jeanette is a great singer and piano player. When she played with "The Smart Cookies", we would go to her shows and beg to hear the B-52's song, "Love Shack". She hated that. She now sings in a group called "GRACE". Take a look at their website. Have I mentioned here yet that the "cost of war in Iraq" thing over there really creeps me out? Well... it does! Anyhow. That link to your friend's music is awesome. Really great voices those women have. Where do they play? Aye lassie them were the good ole days. As I sit here in my rocker more like a rehab doll than a Love Shack mosher I remember when. When we traipsed to Manhattan Beach, the Roosevelt Hotel before it became the hot spot for young Hollywood, some place in WeHo, and of course the Coffee Gallery in Altadena..just to see Jeanette play and sing her heart out. Remember her frenitic dog? And her Tom, may he rest in peace? She always reminded me of Carole King. Okay, Carole King had brown curly hair and was mellow, while Jeanette had straight blonde hair and was far from mellow..maybe it was the voice. Also, cool PAT photo. You are looking mighty cute Mrs. Cleaver. Hey, noticed that Beard Papa made an appearance in that pic. too. He is everywhere. Power to the Papa.